Biography of Barbizon School Plein-Air Landscape Painter. Charles-Francois Daubigny was an important member of the Barbizon school of landscape painting - the group of progressive French painters who devoted themselves to plein air painting in and around the forest of Fontainebleau, near Paris. Dedicated to a non-academic style of naturalism, Daubigny specialized in the creation of extremely peaceful landscapes, similar to those by Camille Corot (1796-1875). Although his friend Corot's fame and mastery has largely overshadowed his own landscape painting, for some art critics Daubigny's work is equally impressive. In addition Daubigny is noted for using delicate hatching in pure colour, in a style which anticipated later Impressionists like Monet (1840-1926) and Renoir (1841-1919). Indeed, he exerted a notable influence on Monet and, less obviously, on the young Cezanne (1839-1906), and may thus be regarded as a bridge between Barbizon and Impressionist landscape painting. The son of the painter Edmond-Francois Daubigny, from whom he acquired the fundamentals of painting, he also studied with his uncle, the miniaturist Pierre Daubigny, the landscapist Jacques-Raymond Brascassat, and the famous historical painter Paul Delaroche (1796-1856). When still in his early teens, he began copying works in the Louvre by the great 17th century Dutch landscape painters including Aelbert Cuyp (1620-91), Jacob Van Ruisdael (1628-82) and Meindert Hobbema (1638-1709), whose realism had a strong impact on his early work. To increase his range he also pursued an apprenticeship as an engraver. Strongly drawn to painting in the open air, he practised his technique at Saint-Cloud and Clamart, near Paris, and in the Fontainebleau forest (1834-35). He finished his training with a trip to Italy in 1835, after which he returned to Paris in 1836 and worked in the painting restoration department of the Louvre. As well as this he earned extra money throught the illustration of books and magazines. In 1839 he exhibited his first painting (St. Jerome) at the Paris Salon. During the next decade he produced a number of etchings of landscapes, some of which were collected in portfolios that made him relatively well known. In search of natural scenery, he devoted himself to touring different French regions and to travelling by boat along various rivers in order to find intriguing subjects for his paintings. In 1843 he settled in Barbizon, where - along with other likeminded artists such as Theodore Rousseau (1812-67), Narcisse Diaz de la Pena (1808-1876), Jules Dupre (1811-1889) and later Jean-Francois Millet (1814-75) - he devoted himself to plein-air painting. (Note: The Barbizon School was an important step in the evolution of French landscape art, representing an important mid-point between Fragonard's Romanticism and Courbet's Realism.) In 1848, Daubigny built a houseboat (Botin), which he converted into a floating studio, in which he lived for long periods, painting the riverbanks along the Seine and Oise, and around Auvers. In 1852 he had two very important encounters: first, with Camille Corot (with whom he became friends) in Optevoz (Isère); secondly with Gustave Courbet (1819-77), soon to become the self-appointed leader of the new form of Realist painting in France. Both artists exerted an important influence over Daubigny. Daubigny's best paintings were produced between 1857 and 1870, being for the most part carefully composed landscapes with trees, a river scene and a varying number of ducks. At least one critic has commented that if Daubigny liked a picture he added another duck or two. So the number of ducks in a canvas is a rough and ready indicator of its artistic merit. 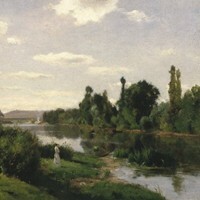 Although most of his pictures are small-scale riverscapes, he also painted large-scale landscapes of which there are two in the Louvre, in Paris. In general, his landscape work is peaceful and dedicated to studies of light and atmosphere. His views of the Optevoz Valley, especially in the paintings The Sluice-Gate at Optevoz (1859), A River Landscape (1860) and Sunset over the Oise, are works that reflect his excellent sense of composition, and that are impressive because of their vast horizons and the deep sense of solitude they transmit. Like all Barbizon painters - that is, those cited above plus Joseph Harpignies, Constant Troyon, Charles-Emile Jacque, and Antoine-Louis Barye - he sought constantly to capture the feeling and atmosphere of being in the countryside, paying particular attention to the accurate replication of light and colour. But it is his Impressionistic brushwork, allied to his habit of finishing a painting on the spot (sur le motif), that sets him apart from some of the other Barbizon artists, and explains his influence over some of the younger generation of Impressionist painters like Monet, Renoir and Pissarro. Daubigny died in Paris at the age of 61. On his deathbed he is reported to have said: "Au revoir. I go to heaven to see if friend Corot has found me subjects for landscapes." Awarded the Legion of Honour by the French government for services to French painting, his followers included his son Karl Daubigny - whose skill at replicating his father's style has led to a number of works being mistaken for those of his father - as well as Achille Francois Oudinot (1820-1891), Hippolyte Camille Delpy (1842-1910), Albert Charpin, (1842-1924) and Pierre Emmanuel Damoye (1847-1916). - River Seine at Mantes (1850) Brooklyn Museum, New York. - Pond with Herons ( 1857) Louvre, Paris. - The Sluice-gate at Optevoz (1859) Louvre. - The Barges (1865) Louvre. - River Bank (1866) The Hermitage, St. Petersburg. - Seashore at Villerville (1875) The Hermitage.  For analysis of more landscape scenes, see: Famous Paintings Analyzed.  For biographies of other Barbizon School artists, see: Famous Painters.  For more details of plein-air painting, see: Homepage.